"We all have something to learn. We all have something to give." 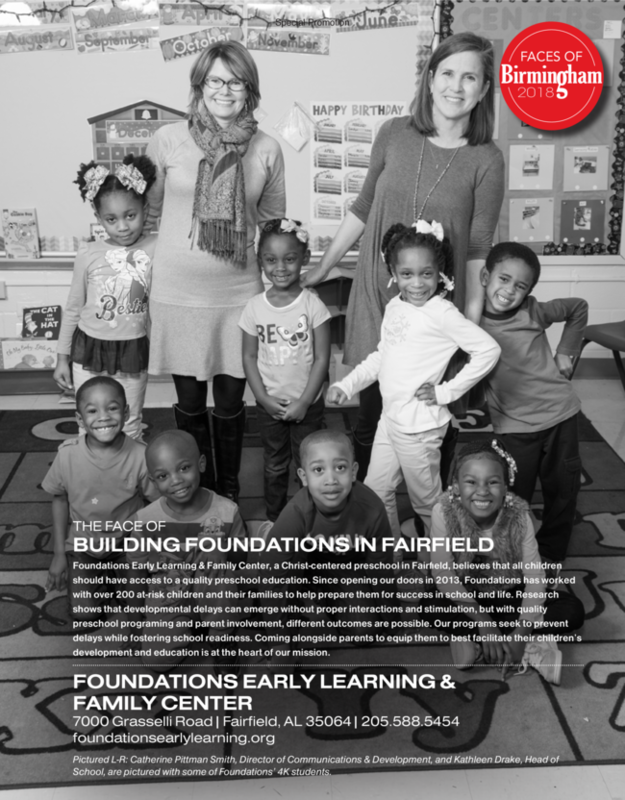 Foundations was recently featured in B-Metro's annual January "Faces of Birmingham" issue. We are so humbled and honored to be included and appreciate the opportunity to share our story with our greater Birmingham community. Click here to see the full issue of Faces of Birmingham in B-Metro Magazine. At Foundations, we believe that all children should have access to a quality preschool education and since opening our doors in 2013 in Fairfield, we have worked with over 200 at-risk families to help them prepare for success in kindergarten and in life. Our programs seek to prevent developmental delays and foster school readiness. Coming alongside parents to equip them to best facilitate their children’s development and education is at the heart of our mission . Foundations Early Learning & Family Center was established in 2013 to serve families in the Fairfield, AL area. It is a high-quality preschool program that provides a Christian environment where children develop academically, physically, socially & spiritually. Foundations partners with families to equip them to prepare the children for school by combining the best-known practices in early childhood education with the love, grace, salvation & power of Jesus Christ.